Wow, barely recovering from last night! We played at the Cherry Tree Pub in Dagenham last night, in aid of the SANDS charity. Didn’t start too well though. We had to play the whole evening, because The Snare couldn’t make it. One of their number was inconsolable following a bereavement, and they had to pull out. Still, two of the band turned up in their two-tone stage gear, to give us moral support, which was a nice touch. But first, we ran through a few songs we thought we ought to rehearse one last time, in the basement. Then we moved our gear up to the stage, we had serious problems with getting the PA right, and getting the DJs to stand down for a bit so that we could have a sound check. Which finally happened after 7.30 when people were arriving! So far, not very good. Instead of starting at 8, we handed back to the DJs until 8.45, and split our set in two. And I must say it went off really well. Earlier feelings of dread melted away as it became a totally enjoyable evening. We were stopped and complimented on our perfornance both in the break and at the end. I can’t speak for anyone else, but by the end I was knackered. However the audience were loving it and it keeps you going. It was absolutely packed in there. We got called back for an encore and we had to repeat a song, as we’d had to use up everything we knew already. We finished shortly before 11pm and the raffle was drawn. The evening raised over £1000 for the SANDS charity. Paul and his family were overwhelmed, they thought that they’d raise £300-£400 and this was totally unexpected. We did record the evening, but unfortunately the tapes were very poor quality, I suspect something to do with the automatic level control on the recorder and being too close to the stage. 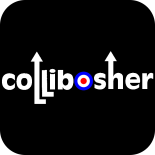 If you’ve not had a look and listen to Collibosher already, have a look at recordings made at our recent Harlow Gig which came out really well!